On the outskirts of the Johannesburg CBD lies a pulsating colourful melting pot that stretches for about 350 stores. Tailored in the vibrant cloth of multiculturalism, a distinct pulse and a rich history, Oriental Plaza reflects the cultural diversity of South Africa. Formerly an apartheid-era attempt to build a distinct identity and a whites-only area in town in mid-1970, the Plaza’s oriental domes echo tales of segregation and the forced removal of disgruntled Indian merchants. Beautifully kept, the Plaza is laid in gold tiles and stands out against the dirt-riddled, pungent and busy CBD setting. As its palm trees and Delhi-Middle Eastern inspired deco suggest, the Plaza was an attempt to tightly hem in Indian shop owners to a part of the city designated for “Indians”. Walking through the Plaza a mystique fills the air, scarlet in colour with a spicy overlay. Yards of golden fabric hang loosely on dusty windows. Rolls of material are carefully arranged on top of tables and behind doors while loosely cut pieces spill into the corridors. Pulled together by the three Grand Bazaar stairs, the plaza’s cultural diversity makes it a very interesting tale. An Indian merchant in a dimly lit, congested store with weary-looking drapes carefully studies his curtains trying to negotiate a price for a customer. “How much do you have my friend?” he asks, studying the customer carefully. “That’s good,” he says quickly, carefully wrapping a shiny-metallic curtain in a black plastic bag. The Oriental Plaza is known for its fabrics that are sold at discount prices. There is rarely a fixed price – it’s an Eastern market where bargaining is part of the experience. The Plaza is known for its richness and multiculturalism, “a fashion melting pot” as many term it. Weaving your way around, your eyes are treated to gracefully draped golden-brown saris from Leela’s, carefully beaded shweshwe print khetshemiyas (a head-doek worn by Xhosa brides) at KwaNtu Afrocentric designs and sharply pressed, Italian imported tailored men’s suits from Khaliques. Kishore Desai, a 67-year-old who has owned Leela’s for 35 years, says he takes pride in his sari business and expresses gratitude for his multiracial clientele. “People of all races come into my shop and that’s what makes this place unique,” he says. Situated in the pearl of the Oriental Plaza, Leela’s, shop no. C87, stands in the Grand Bazaar. Enhanced by bright lighting, it holds an untouched elegance displaying sunset-burnt sari drapes with golden embroidered borders, long-tunic silky metallic kurtas and golden Indian jewels. Leela’s, meaning playful, has been in the Desai family business for 35 years. Named after his great-grandmother, Desai says he takes pride in his store that has been passed through generations. “It is very special to me. It has seen many generations and that is very important. It is a family owned business and we have been here since the beginning,” says Desai. Walking around his store, Desai says his garments, which he terms “Eastern wear”, are part of an unbroken tradition. A poised woman, Desai’s wife stands next to him, her expression slightly guarded. The long, burnt-orange trail of her sari hugs her figure. The six-and-a-half metre cloth is humbly draped around her, embroidered with what she calls zardosi embroidery, a golden-metallic thread used for embellishment. Desai agrees his saris are the top-selling garments in the store. “My saris play a great part in my business. They are very seasonal, the different colours, the different parts of the year and things of that nature,” he says. But while saris are associated with Indians, Desai says it is his multicultural South African clientele who have kept his business thriving over the years. The Oriental Plaza cultural mix opens an insight into how culturally diverse South Africa is. Khajara Firoz, a 29-year-old who was born in Pakistan, says his business has taught him an appreciation of other cultures. 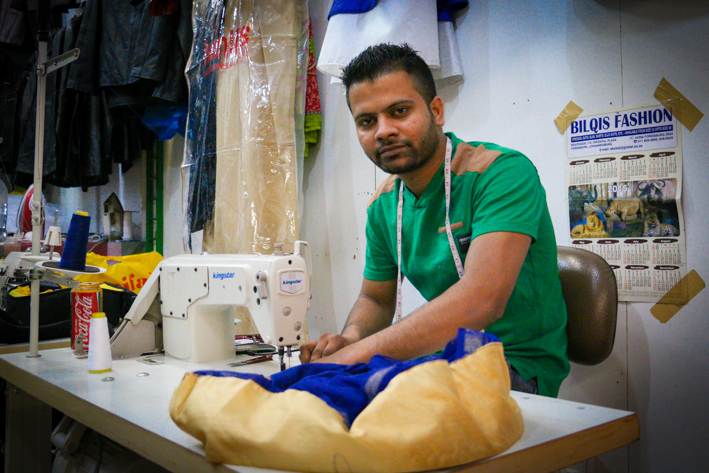 At the opposite end of the Oriental Plaza from Leela’s, next to a store heavily crammed with Eastern garments and assorted jewellery, Firoz sits at his sewing machine. He is stitching a champagne-gold, plain-weave sheer material over an ivory coloured lace fabric. It’s for a girl who is attending her matric dance farewell. Firoz has been a women’s wear designer for the past nine years. He says he deals with matric dances, wedding gowns and African traditional men’s suits – “anything”. Sitting in his dimly lit 50 square metres store in the Grand Bazaar corner, Firoz says he taught himself to sew. His store has two other designers from Pakistan, one who deals with leather garments and the other Eastern-wear garments. Asked about the reception of his business in South Africa, Firoz’s eyebrows shift together slightly as he expresses his pain. “Since I moved to South Africa in 2007, my business has gone through a lot of things,” he says. Firoz says his business has faced many challenges. His voice breaks underneath his words, a shift from the light, cheerful person he was 20 minutes ago. The most recent blow to his business was this year’s xenophobic attacks that chased away his foreign customers. “Most of my customers are from Mozambique and Malawi, now those customers I am certain are scared to come to South Africa. I often go to Mozambique and supply my stuff because they are scared to come this side,” Firoz says. He says spending money on travels to Mozambique and Malawi for his customers, importing his fabrics and the weakening rand have led to a decline in his business. This has led to him being open to using South African fabrics supplied by customers. He has worked with many local fabrics for his African suits, such as the shweshwe fabric, a classic, indigo printed and dyed cotton fabric used by many African cultures in South Africa, and also the kente cloth fabric used by Ashanti people in Ghana. Firoz says he always wants to try something new for his business to make it timeless and isn’t afraid to play around with fabrics. “I like the African prints, they are pretty and colourful. I make Western-style African male suits,” he laughs. “These suits are your normal suits but I use African prints, it all depends on the customer. They can be very hard to make but I only strive for the best,” he says. Firoz says he appreciates African cultures and wants to learn more about the fabrics. “I am learning every day and I try to improve every day,” he says with a smile. The colourful resonance of the Grand Bazaar gives character to the plaza. Many spaces in South Africa under apartheid were used as tools in an attempt to define people’s heritage. In the case of the Oriental Plaza this had a mixed result. Developing its distinct urban character, the Plaza has managed to create a cultural fusion, a South African reflection of its distinct ethnicities and cultures. One of the distinctive stores at the Plaza is KwaNtu Afrocentric Designs. KwaNtu, meaning “a place of gathering”, is where “everyone is welcomed, no matter the race,” says Vicky Ginya, store manager. The floor of the store is sprinkled with cuts of colourful pieces of African-printed fabric. Known as “Afrocentric” in the fashion industry, KwaNtu has managed to emphasise the African, shweshwe and Ghanaian presence in an Eastern-Indian neighbourhood. Ginya – “Sis’ Vicky” to her customers – carefully places red and yellow beads on a black cloth. She refers to this black cloth embroidered with white thread as isikhetshemiya. Ginya says the beads, which she refers to as intsimbi, are symbolic. She adds that these beads all add up to the idea of marriage as a symbol of the abundance of love and rebirth as you are entering a new chapter. Started in 2013, Ginya says the idea to place the store at Oriental Plaza was “to mix ourselves as we are in Mzansi Africa”. Ginya adds that many shop owners at the plaza send their customers to KwaNtu. Pointing to a white and black dress complemented with scarlet red and white beads, Ginya says they take pride in making everyone beautiful. 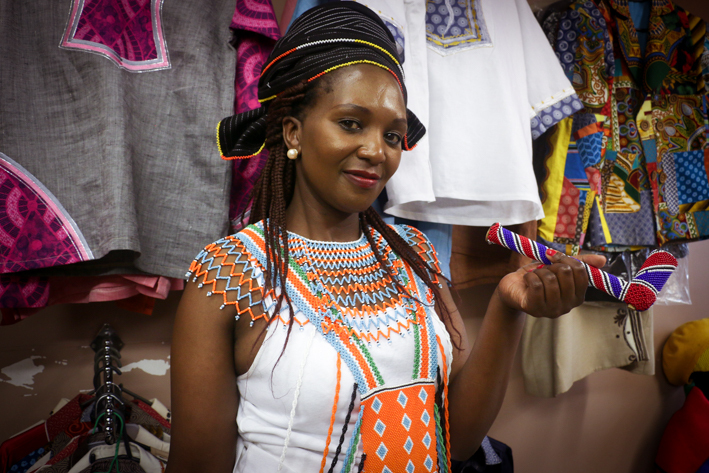 Ginya says white South Africans and European tourists have taken a liking to the beadwork sold at KwaNtu, saying she wants them to see themselves as Africans and get the African experience. While many shop owners says businesses at the Plaza are declining, many Mayfair business owners can only dream of reaching the golden Plaza. Along 8th Avenue and bordered by Bird and Hanover streets lies a less colourful, crammed Amal Centre in Mayfair, which some describe as “Little Mogadishu”. Held tightly together by the smell of sabayad (flatbread) and baasto (pasta), “Little Somali” is a refuge for many and a home for the homeless. Ethiopian coffee makers, Pakistani shop owners and Somali restaurants can be found in the area. On Fridays, an owner hurries to close his shop as prayer emanates from different mosques and engulfs the “little” town. This hub is home for the working class. Somali refugees own many businesses in Little Mogadishu, most notably textile shops. Many Somalis who occupy this space silently hope one day they will reach the Oriental Plaza. Walking through the Amal Centre, which was once a BMW showroom, many rolled-up fabrics can be seen peeping through small square stores, much like the setting at the plaza. Somalis in South Africa have experienced violence and discrimination, an exclusion that has driven many of them to Little Mogadishu, much like the forced removals at Fietas under apartheid in the 1970s. 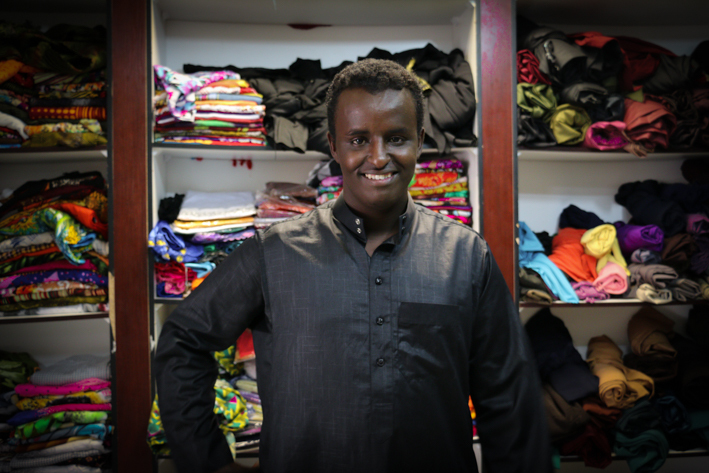 For people like 22-year-old Mohamud Mohamed, the Oriental Plaza is where he wants to be. “These are imported legally, nothing here is illegal,” says Mohamed. Mohamed works at Al-Haramayn, a shop owned by his mother since 2006. “The things we sell here are mostly traditional women Islamic clothes. We also sell cosmetics and perfumes,” he says. Mohamed says money is scarce in the area and his mom is thinking of closing her store. Mohamed complains about the overcrowding of the shops in the centre. He says he wishes that his mother had a “much better” store at the Plaza. “Back then, she was one of the people that owned a shop here. But now there are more people,” he says. Mohamed says it is hard to make money at the centre and one day hopes to join shop owners at the Plaza. “Everything is hard this side, my only hopes are to take this business to the Plaza and maybe make a living that side,” he says. Mohamed’s friend Abdul Naser, a Somali dressmaker, sits on a once-white plastic chair, now smeared with brown paint, and sighs heavily. The small room with chipped, lime green paint has seen better days. 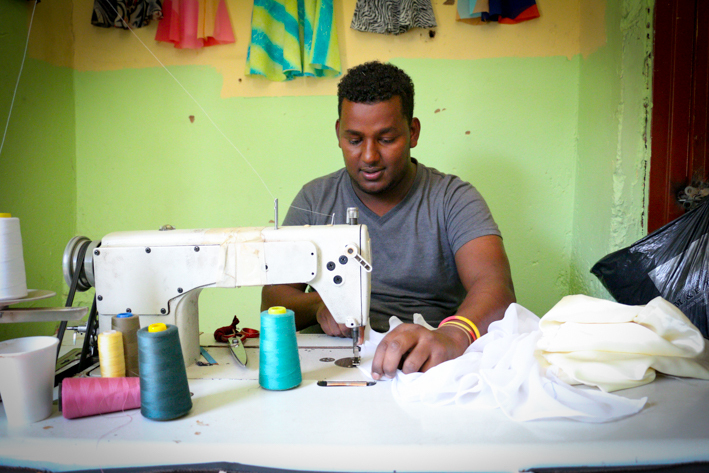 Naser, sweating in the scorching sun, stands up from his sewing machine to get a customer’s garment from a yellow and red plastic bag riddled with holes hanging on a wire string. Naser says he is closing down his shop soon. A woman wearing a navy abaya complemented with a faded blue hijab interrupts Naser as he is about to speak. He looks at the R200 note she presents him with hunger and desperation in his eyes. “I am sorry, business needs to go on now. Interview over, you can go now,” he says, dismissively waving his hands.